To accomplish this he has carved a novel out of one hundred and fifty years of Texan history and three generations of the one family, the McCulloughs. Three voices dominate: Eli, captured and adopted by Comanche, whose story begins in the middle of the nineteenth century; Peter, his son, whose diary focuses on a two year period (1915-17) when thousands of Mexicans were murdered in Texas; and his great-granddaughter, Jeanne Anne, looking back on her life from the perspective of the present. Meyer arranges these narratives in alternating chapters rather than chronologically, always a dangerous choice for a writer as establishing three equally compelling characters is no easy task. Despite the particularly gripping nature of Eli’s story, Meyer succeeds in ensuring the reader has no regrets in moving frequently between time periods and viewpoints, often by the sheer force of his writing. The immediately established intention to cover such a long time period contributes to the novel’s epic feel, while at the same time conveying one of Meyer’s central themes, that of transience, an idea at odds with the historical epic that Meyer is imitating at the same time as he undermines it. This historical violence is echoed in the violence that permeates the novel, beginning with Eli’s capture by a Comanche raiding party. His mother and sister are raped and then killed; his brother (taken like him) is killed for not being strong enough. (This idea also permeates throughout the novel as the McCullough children of each generation are judged according to whether they have that strength). Eli’s own violent path takes him from the Comanche to the Texas Rangers and culminates in the slaughter of fellow ranchers the Garcias in 1915, women and children included, for supposedly stealing his cattle( but in fact for being Mexican). Eli goes on to acquire their land, their ruined house fuelling Peter’s guilt. Violence is not only committed on other human beings but on the land itself. By the end of the 19th century cattle and poorly thought out irrigation have damaged the land (“The country was ruined – as a woman would have been after riding in the cat wagon”) – the pasture is disappearing and the search is on for the oil that will sustain and increase the McCullough’s fortunes. The American dream of pursuing wealth is not only seen as destructive to the land and to others, however, but as contradictory to the American dream of freedom. In the novel happiness is associated with freedom, but land, wealth and family reputation all hamper rather than enhance this freedom. Eli’s admiration for the Comanche is based on their refusal to give up freedom for more food or better shelter. Both Peter and Jeanne Anne find themselves isolated by their family and position. 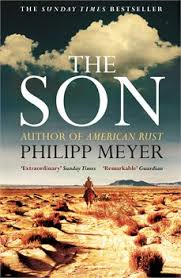 The Son is a dark, evocative novel of a lost America which, as its inheritance obsessed title suggests, provides a rather terrifying insight into the America of today. You are currently browsing the archives for the Philipp Meyer category.